Just how long is the shelf life for deck waterproofing products? Can those products sit in storage indefinitely? Does an expiration date really matter? I mean, after all, how many of us have eaten a cup of yogurt days after the expiration date and not suffered gastrointestinal distress? What about the expired tubes of toothpaste used in bathrooms all across America every day and night? This practice doesn’t seem to be resulting in a rash of nationwide ER visits related to out of date toothpaste. Do expiration dates really matter? When it comes to Pli-Dek waterproofing systems, expiration dates do matter. The quality of product, successful application, performance capabilities and durability are all affected by time and age. Warranty benefits are also conditional upon using the products according to the guidelines provided by the manufacturer. All of which are affected by the quality of the product. 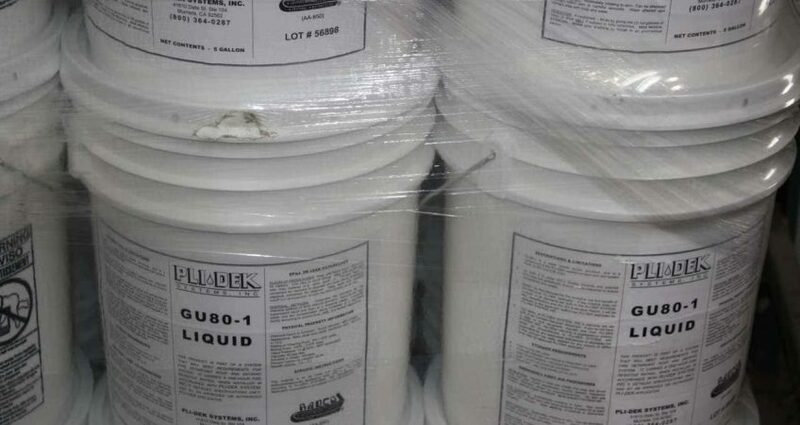 When stocking this product for use on future projects, Pli-Dek stresses the importance of rotating stock accordingly, bringing older containers to the front of the line. Manufacturer will not be responsible for out of date products that are used and then perform improperly. Pli-Dek’s published ICC Evaluation Service Report clearly indicates that their products must be installed according to their installation instructions. This would include using the product before its expiration date. Temperature below 75 degrees Fahrenheit. No exposure to direct sunlight, heat or flame. Wrap or seal to minimize moisture exposure. Do not store stacked in conditions that will create tension, compression or deformation of container. For maximum quality in product performance, rubber product professionals recommend that polymers be stored for as short of a time as possible. As time passes the physical properties of the polymers are undergoing changes that will eventually render it unusable. Polymer aging is, in chemistry speak, a chain oxidation reaction. Macromolecules degrade and begin to form three-dimensional structures. Think of a macromolecule as a cluster of atoms. As the product sits on the shelf growing old, these clusters begin to cross-link with one another. Think of it as polymer getting bored as it sits around with nothing to do. All of those bored atoms begin branching out to socialize and form new social groups. The appearance of what look like cracks rather than a smooth surface after application. Waterproofing projects are a structural investment. It is important to maintain the credibility of a warranty by using the products by the expiration date. Don’t try to cut corners and use an out of date product that delivers a substandard seal then discover further loss by a warranty not being honored. For more information on how to get the most out of a Pli-Dek waterproofing system, please contact us.